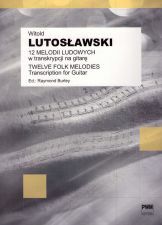 New book released May 09 - in Poland; Witold Lutoslawski - Twelve Folk Melodies arranged by Raymond Burley. It will become available in the UK at a later date. Witold Lutoslawski's set of Twelve Folk Melodies was written in 1945 for the piano in response to a commission from PWM Edition (Poland). The pieces are essentially arrangements of Polish folk music, not dissimilar to Miguel Llobet's guitar arrangements of Catalan folk songs. Lutoslawski's pieces originate from several different parts of Poland. Several years ago the English guitarist Julian Bream made an arrangement of the pieces and apparently consulted the composer before performing his edition; the arrangement remains unpublished. Many years ago I arranged a handful of the pieces for the guitar and more recently was encouraged to complete the set. I felt it necessary to relocate some of the pieces to more accommodating keys; one or two further alterations were required in order to present the pieces convincingly on the guitar. However, there is nothing that dilutes the original material or compromises the composer's intentions. al. Krasinskiego 11a, 31-111 Krakow, Poland.